Are you prone to stress and anxiety? Do you believe it's holding you back from being successful in your career and making money? It doesn't have to be this way. In fact, when your stress and anxiety are properly managed, there may be ways to turn them into positive things for you financially — like extra cash! 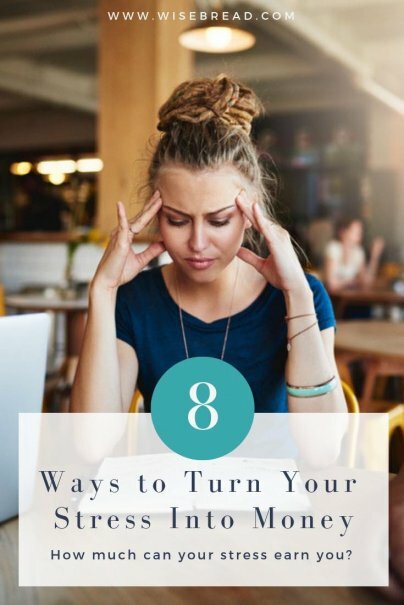 Let's take a look at these ways you can turn stress into financial freedom. Employers don't want their employees to be stressed out, but they do want people who care. So if you have a little bit of anxiety about your work, that could be a good thing. If you can find a healthy way to channel that stress into being productive and conscientious, it will pay off in the workplace. The chemical produced by stress can, at certain levels, actually enhance alertness, memory, and attention. Many managers even say that giving workers a small amount of anxiety can help them perform better overall. "Without anxiety, little would be accomplished," David Barlow, founder of the Center for Anxiety and Related Disorders at Boston University, told Fast Company. Stress can be debilitating. But excitement can help you reach new heights. There's a fine line between stress and excitement, but researchers say you can often find ways to frame stress in a positive way. In her paper, "Get Excited: Reappraising Pre-Performance Anxiety as Excitement," Alison Woods Brooks of Harvard Business School argues that you can perform better in a situation simply by repeatedly telling yourself, "I am excited." And the more you do it, the more it helps. "Highly skilled individuals may be more likely to say ‘I am excited’ before they tackle challenging tasks. In this way, emotional self-statements could operate in an upward spiral process in which successful individuals are more likely to express excitement, and saying ‘I am excited’ then improves subsequent performance," Brooks writes. For many people, stressful and anxious thoughts come during downtime. It's hard to worry about things when you're busy at work, and the stressful thoughts may only come when your brain has a chance to think. If this sounds like you, maybe a second job will help you stay busy and keep your mind from wandering into Stress Town. And if you're the type of person who gets stressed about never seeming to have enough money, a second job may be what you need. It doesn't have to be another full-time job. Maybe you can take up freelance writing or design, or a craft. Anything to stay busy, keep your mind off your troubles, and make a little extra money in the process. In his book, My Age of Anxiety, writer Scott Stossel argues that being anxious can be helpful to people in leadership roles. He said anxious people are more likely to be tuned into other people's emotions and social cues. In their book, Wiser, researchers Cass Sunstein and Reid Hastie argue that groups can make the best decisions when they are led by an anxious and detail-oriented person. So who knows? Maybe your stress is your ticket to becoming CEO. If you are prone to anxiety, you worry about the future. That means you're probably good at preparing yourself financially for the days ahead. You may have cash set aside for every conceivable emergency, and are aggressive about saving for retirement because you stress about running out of cash as you age. If this sounds like you, you're probably in great shape financially and may even become quite wealthy as your investments and savings grow over time. If you suffer from anxiety or high stress, there's a lot of evidence suggesting that time with a pet can help you. Studies show that pets can provide the kind of unconditional love that would benefit those with mental health conditions, and may even improve social interactions. Pets can often be creatures of routine, demanding to be walked and fed at certain times. Being forced into that kind of routine may also be helpful to those with stress and and anxiety. What's more, if you make money by walking pets, you'll be getting some exercise, which is also beneficial when battling stress. Perhaps you've found that your stress goes away when you play the guitar, or paint, or make pottery. Maybe you feel better when you act or dance. You may think of these activities as mere outlets for your stress, but they can be moneymakers. Make some music and join a band. Sell your artwork. Join a theatre company. Take that stress and go make some dough. About 40 million adults in the United States suffer from some sort of anxiety disorder, according to the National Institutes of Mental Health. That's a huge potential audience of people who may be looking to get advice, or simply connect with those who are going through similar challenges. Finding ways to write about your stress and anxiety may be therapeutic for you, and if the blog takes off, you can earn a little bit of cash in the process. What other ways can you channel stress into money? Share with us!